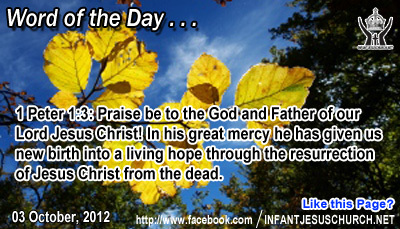 1 Peter 1:3: Praise be to the God and Father of our Lord Jesus Christ! In his great mercy he has given us new birth into a living hope through the resurrection of Jesus Christ from the dead. Heavenly Father, We praise you from the bottom of our heart for your unbelievable and glorious grace which has brought eternal victory out of mortal suffering. Thank you for paying the price to make it so. You are marvelous beyond our words. You are worthy of more praise than all your children's voices together can tell. Our hope will live forever because he is risen and reigning as Lord. To you be always all honor, glory, and majesty forever, and ever, in the name of Infant Jesus your Son and my Lord, Amen. A plowman who turned back while plowing his field caused the line or groove he cut into the soil to become crooked. One crooked line easily leads to next person until the whole field is a mess. The plowman had to look directly ahead in order to keep the plow from going off course. similarly, if we look back on what we have freely left following to follow the Lord – whether that be some interruption, attachment, or sinful practices which leads us away from doing God's will – our path will likely diverge and we'll neglect what God has for us. The gospel does not record the answer from these three would-be disciples. We are only left with the question which Jesus means for us as well. Are we ready to take the path Jesus offers? His grace is enough and his love is strong. There is nothing greater we can do with our lives than to place them at the service of the Lord and Master of the creation. We cannot give out God in generosity. Jesus promises that those who are eager to part with what is most dear to them for his sake "will receive a hundred times as much and will come into eternal life". The Lord Jesus offers each one us a kingdom of lasting peace, eternal joy, surpassing love, enduring friendship, and abundant life. Is there anything holding us back from following the Lord and his will for our life?